If you ask people to describe bluegrass music, you get a wide range of answers. A lot think of nasal vocals, square dance fiddle tunes, Jed Clampett or Hee Haw. Others might know of the more modern versions of Nickel Creek, Old Crow Medicine Show or Allison Krauss. There are the classic bands like Flatt and Scruggs, Reno and Smiley, The Stanley Brothers, The Osbourne Brothers. The Newgrass musicians like Sam Bush, Bela Fleck, The Nitty Gritty Dirt Band, and Peter Rowan. I could go on for pages. But. .. If you ask anyone who knows anything about Bluegrass one person they will know is Bill Monroe and for good reason. Bill Monroe and his Bluegrass Boys started bluegrass music. They named the style of music after the band. The “classic” Bluegrass quintet featured Bill Monroe on mandolin, Lester Flatt on guitar, Chubby Wise on fiddle, Howard watts on upright bass, and Earl Scruggs on 5-string banjo…. 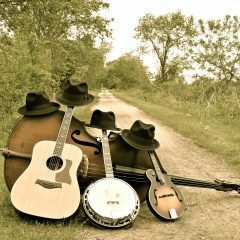 Bluegrass Music – Chicago Style! This entry was posted in Uncategorized on November 8, 2016 by Truman's Ridge. Well written. Enjoyed the read.